Thank you for your visit. Images of you, your associates, products, and facilities create lasting impressions that are important for your success. Paul is available to provide professional commercial photography to create images for print or the web that will make you proud at a reasonable price. He also has excellent photo editing skills to enhance and modify your existing images for the web or for print. His skills at Photoshop can be used to render images of architectural and landscaping plans. 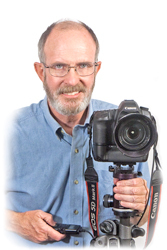 Paul enjoys photographing beautiful places and sharing the images with others. His professional mission is to deliver attractive media services for people through working relationships that honor God. That means that enjoying relationships with integrity and mercy come first. May God's peace be with you today. Copyright © 2015, Paul T. Palmer, Jr. all rights reserved. No images or content may be used without written consent.